About Our Office | How are appointments scheduled? | Do I stay with my child during the visit? 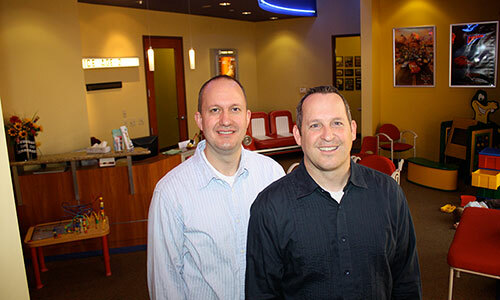 The office of Casa Grande Pediatric Dentistry is specially designed for children. It is equipped with smaller dental chairs, smaller instruments for little mouths and fun decor. For the comfort of young children while in our office we offer a variety of toys, books, video games, and a kid sized movie theater. 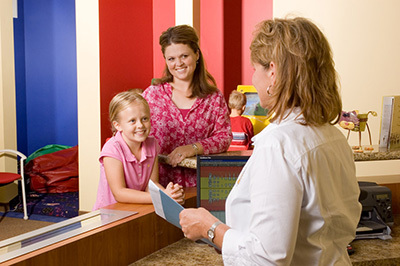 We want your child's visits to our office to be as enjoyable and pleasant as possible. By using the latest techniques and materials, Dr. Johnson and Dr. Schow insure your child receives the most up to date treatment available and the highest quality care. Our fully computerized office utilizes the latest technology available, including digital radiography which uses 50% less radiation than traditional x-rays. We offer several methods of conscious sedation for your child's dental treatments. A combination of nitrous oxide (laughing gas) along with a local anesthetic is safe and effective even with some of our most nervous little patients. Ask Dr. Johnson and Dr. Schow about these and other painless methods of conscious sedation for your child's dental procedure. We want your child to be comfortable and safe while in our care. The doctors and their staff believe every question you have, whether dental or administrative, is important. To insure that you have all the information you need, we promise to answer all your questions and speak candidly with you about your child's symptoms, treatments and our recommendtions. Working together, we can keep your child's smile beautiful and healthy with quality care that fits into your budget. In addition to filing insurance forms for you, we offer Care Credit and gladly accept Master Card, Visa, Discover, and American Express. Our staff will be happy to assist you with any questions you have. For your peace of mind a doctor is always on call for our patients. In addition, each member of our team is highly skilled and dedicated to meeting the needs of each young patient. Our Staff is highly trained and all are CPR certified. Appointed times are reserved exclusively for each patient we ask that you please notify our office 48 hours in advance of your scheduled appointment time if you are unable to keep your appointment. Another patient, who needs our care, could be scheduled if we have sufficient time to notify them. We realize that unexpected things can happen, but we ask for your assistance in this regard. Payment for professional services is due at the time dental treatment is provided. Every effort will be made to provide a treatment plan which fits your timetable and budget, and gives your child the best possible care. We accept cash, debit cards, Care Credit and most major credit cards. If we have received all of your insurance information on the day of the appointment, we will be happy to file your claim for you. You must be familiar with your insurance benefits, as we will collect from you the estimated amount insurance is not expected to pay. By law your insurance company is required to pay each claim within 30 days of receipt. We file all insurance electronically, so your insurance company will receive each claim the day of the treatment. You are responsible for any balance on your account after 30 days, whether insurance has paid or not. If you have not paid your balance within 60 days a re-billing fee of 1.5% will be added to your account each month until paid. teens in in the surrounding cities of Arizona City, Coolidge, Eloy, Florence and Maricopa, AZ.